Wireless dog fences are great for pet owners who want to give their pet the freedom to roam around without constantly having to keep an eye on them. Anytime your pet gets too close to the perimeter a warning will be sent to the collar. In most cases this is enough to cause the dog to move away. However, in some cases your dog may ignore all warnings and run through the perimeter into the street. This is when having a wireless dog fence with GPS comes in handy. Instead of running around searching for your pet the GPS system makes it super easy for you to track their exact location. There are 3 very important things you need to look into before investing in a wireless dog fence with GPS. The first one is price. When it comes to price always remember that expensive doesn’t necessarily mean better. As a matter of fact, in many cases the most expensive device turns out to be the least effective. In order to find the best product for your budget you will need to do a bit of research. This way you will be more likely to get a product that not only does what you need it to do, but that also fits your budget. The second thing you want to consider is performance range. The range you need will depend on how you plan on using the device. For instance, if you will be using the device around the house a 3 mile range will be plenty. If on the other hand you will be taking your dog out for hike, in this case you will need the longest range you can find. The last thing you want to consider is whether or not there are any monthly or yearly fees. Most people are completely thrown off guard when they realize they have to pay a subscription fee for their device to work. And while there are some units that require no subscription fees, the reality is most units are subscription based. If you want the best possible service and functionality, you should be prepared to pay a subscription fee. This is important because it is an additional expense that you probably weren’t expecting to have to pay. Generally speaking the subscription fees are no more than $10 per month. And while that isn’t necessarily a large sum of money, it can seem large if you are already on a tight budget. Now that you know the 3 things you need to look for before investing in a wireless dog fence with GPS, let’s dive in and discuss 4 of the top units currently on the market. 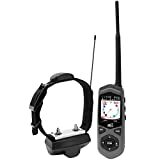 The Garmin T5 GPS dog collar is a top-mounted, high-sensitivity GPS/GLONASS receiver that can be used with the Alpha 100 or the Garmin Astro 320. It is perfect for those who love to go out hunting with their dogs. It features LED beacon lights that can be activated using the handheld device. The lights can be seen up to 100 yards away and work great at night and in low light conditions. The Garmin T5 GPS dog collar is tough and rugged. 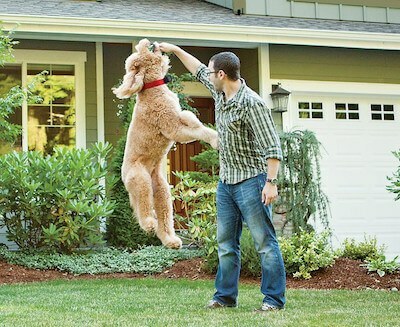 It can handle almost anything your dog throws at it. It can track your canine up to 9 miles away and is water resistant up to 10 meters. The Garmin T5 has a rechargeable battery that can last between 20 and 40 hours. Some users have complained that the device is hit and miss. Sometimes it works and sometimes it doesn’t. The device does not work outside of the United States. 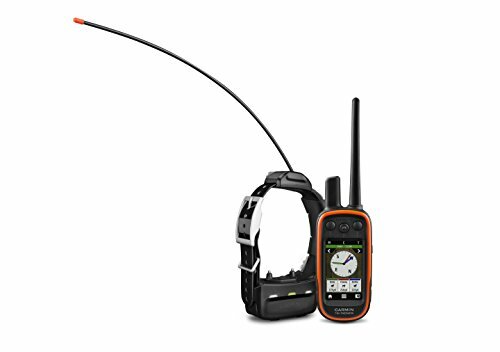 The Garmin Alpha 100 TT is a multi-dog tracking GPS and remote training device all in one. With it you will be able to track, and train, your dog all at the same time. The device allows you to setup virtual boundaries using your map. Anytime your dog ventures outside of those boundaries, which is referred to as the geofence, you will receive an alert and be able to immediately recall him. The Garmin Alpha 100 TT gives you the ability to track and train up to 20 dogs at one time. The compass screen will give you detailed information about the speed at which your dog is moving, the direction they are travelling, and how far away they are from the other dogs you are tracking. You can easily track each dog and never worry about correcting the wrong one. Anytime one of your dogs is “Treed” or ‘On Point” you will receive a notification. The training screen makes it easy for you to correct and recall multiple dogs with the push of a button. If you are a hunter the Garmin Alpha 100 TT makes it easy for you to keep up with all your hunting buddies. Just set your Alpha to show where other Alpha handhelds are located. Please note this option does not work with the Astro. The device features 18 levels of momentary stimulation and 18 levels of continuous stimulation. There is also an audible tone and a vibration command. Thanks to the preloaded TOPO U.S. 100K mapping that comes with this device you will always know what your surroundings are. Transflective 65-K color TFT touchscreen display for easy viewing. Glove friendly touchscreen for easy control. Device will automatically send signal to recall when you receive an alert. Interface is not user friendly. You will need to scroll through various menus just to be able to control basic functions. Some users have reported cracks in the collars after only a few months of use. You may have to reprogram the device every time you use it. 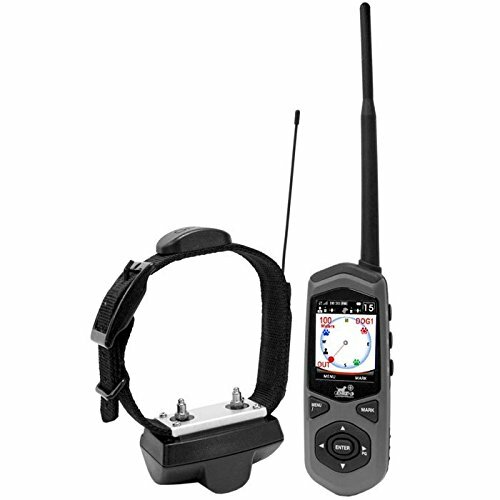 TheDog Expedition TC1Border Patrol GPS System and Remote Trainer is one of the first GPS based containment systems of its kind. It’s portable, wireless, and has the ability to cover a radius of up to 800 yards. Anytime your dog gets too close to the boundary line a warning notification will be sent to the collar. The warning can be vibration only, audible beep online, vibration with delayed stimulation, or beep with delayed stimulation. When in GPS e-Fence mode there are 50 levels of stimulation. This makes it easy to find the best correction for your dog. And thanks to the “welcome home” feature your dog will have the opportunity to return to the safe area without being corrected. In training mode there are 50 intensity levels of “Nick” and continuous stimulation. The training range is up to 2 miles. You can also track the location of your dog up to 2 miles, and read the status of the collar using FenceView tracking and status. With the Dog Expedition TC1 your dog will have freedom and you will have peace of mind. Truly portable. Can be used just about anywhere. Truly wireless. No need to dig trenches or bury wires. Can function up to an 800 yard radius. Many users have complained that the battery doesn’t hold a charge. The antenna is known to break off after only a few months. 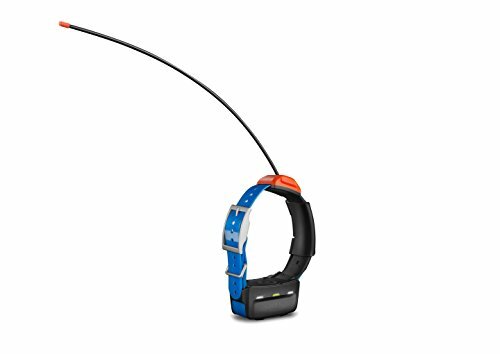 The Findster Duo+ is a next generation pet tracking device that works on both dogs and cats. It is one of the first GPS dog trackers that doesn’t require a monthly subscription. The device works by using 2 modules. One for you and one for your pet. Using MAZE technology the devices are able to communicate wirelessly within a radius of up to 3 miles. MAZE technology completely eliminates the need for cell phone coverage which means there is no need for any monthly fees. 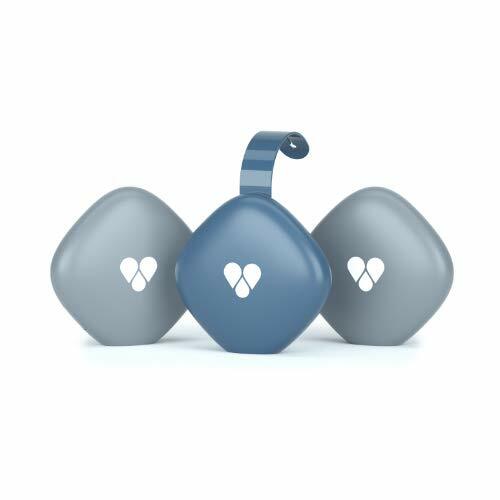 With the Findster Duo+ no pet will ever be left behind because it allows you to track up to 3 pets at the same time. Using the Findster app you will be able to monitor your pets in real time. The app uses reliable and precise technology which allows you to create safe areas around your pet. This is all done using the map inside the app. The app will also notify you the moment your pet ventures outside of the safe area you have created. The app keeps a history of your walks and past locations so you can easily detect trends and patterns. Having this information will help you prevent your pet from escaping in the future. The Duo+ also acts as a pet activity monitor allowing you to easily keep track of your pets physical activity. Unlike other very popular wireless dog fences with GPS, the Findster Duo+ works anywhere in the world. Even if you are in a remote location living off the grid. You will still be able to train and track the location of your pet. This is because the Duo+ does not need cellular coverage to work. The modules are waterproof and shock resistant. This makes them the perfect companion for all your pets adventures. While the Findster Duo+ gives you the ability to track your pet for up to a 3 mile range, the exact range will depend on your surroundings. There are two key factors that will affect range performance. They are the physical environment you are in, and the current weather conditions. These two factors will influence the modules ability to connect and accurately track your pet. Based on these two factors you can expect a range performance of around 0.5 miles in urban areas, and over 3 miles in open environments where there aren’t any trees or buildings. For reference, the record for range performance currently stands at 10 miles. Please keep in mind the Findster Duo+ is optimized to track your pet during walks. It is not recommended for indoor tracking or remote monitoring. The battery life can range between 12 hours all the way up to 3 days. It all depends on how you choose to use the device. If you have live tracking on all day the battery will last a maximum of 12 hours. If you have live tracking on for two 30 minute walks per day you can expect the battery to last up to 3 days. If you only track all day activity at home the battery can last up to 7 days. GPS tracker and pet activity monitor all in one. Battery can last up to 7 days depending on how you choose to use the device. You can track up to 3 pets at the same time. Gives you the ability to track your pet in real time. Sends out instant alerts anytime your pet goes outside the safe area. Works in every country. Even if you are living off the grid. Range performance of up to at least 3 miles. The app will only work on one phone at a time. Performance range can be limited based on your surroundings. Some users have complained that the battery lasts way less than the 12 hour minimum.